As reported earlier by Imposing Headlines about the auction of late famous actress Liz's jewelry and attire at Christie's, the BBC now reports that the collection of jewels owned by the late Dame Elizabeth Taylor has fetched $116m (£74.9m) at a New York auction. Christie's sale of 80 items had been estimated to raise about $20m (£13m), but took more than double the record for a single collection. 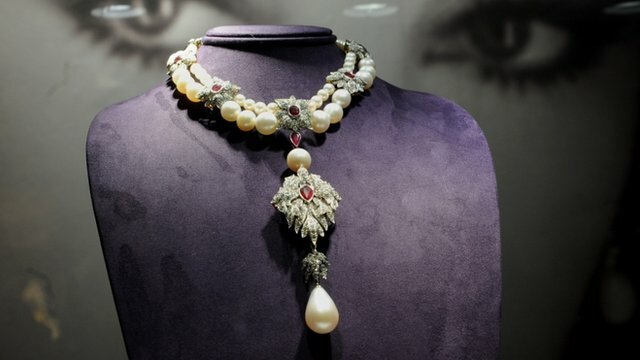 The highlight was a necklace featuring a 16th Century pearl which sold for $11.8m (£7.6m), a record for the gem. The actress' famous 33.19-carat diamond ring, given to her by Richard Burton, also sold for $8.8m (£5.7m). Read complete post for mmore details on the auction.